Summary: One of the most popular walks in Swaledale which links two of the prettiest villages in the upper part of the iconic dale. 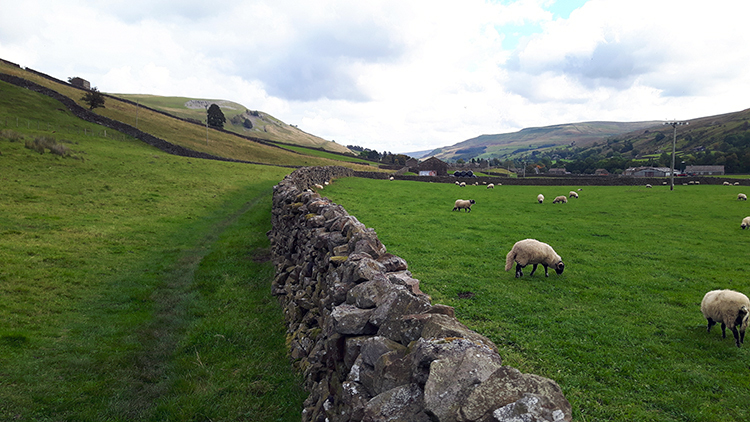 The walk begins in Muker and utilises paths to the north of the dale including a stretch of the Pennine Way to reach Thwaite. 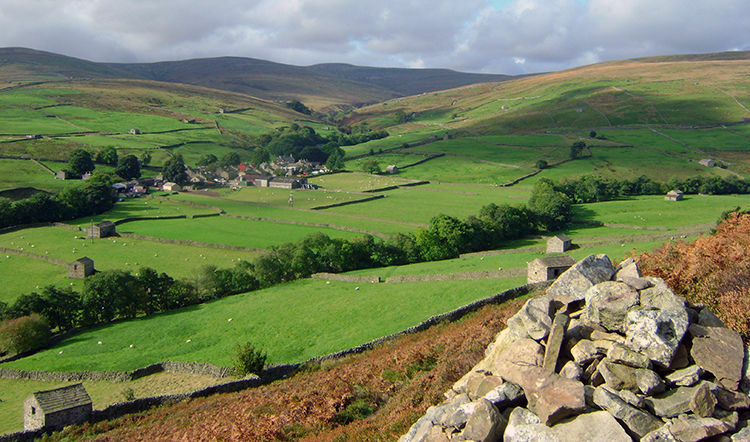 This route allows the walker to enjoy elevated views of Swaledale and gives a perfect view of the winding river below. The return from Thwaite is by the valley bottom and mainly across fields with a short stretch of road near Usha Gap to negotiate safely. The Walk: My wife Lil and I were staying in Reeth for a while with my brother Dave and friends Steve and Jan. As is usual on such occasions I was tasked with designing some local walks for all of the party to enjoy. This was the first one I had come up with and it was not a difficult task. The brief of "an easy walk with delightful scenery and lovely villages with an opportunity to take a refreshment break in the middle" was easily attained. It was mid October and the daylight was significantly shorter than just a couple of weeks earlier. Longer nights rush in at a pace during October but the disadvantage of darkness allowed for us to make leisurely preparation for the day ahead. Appropriate enough for the senior citizens among us. Only Dave failed to make the classification! 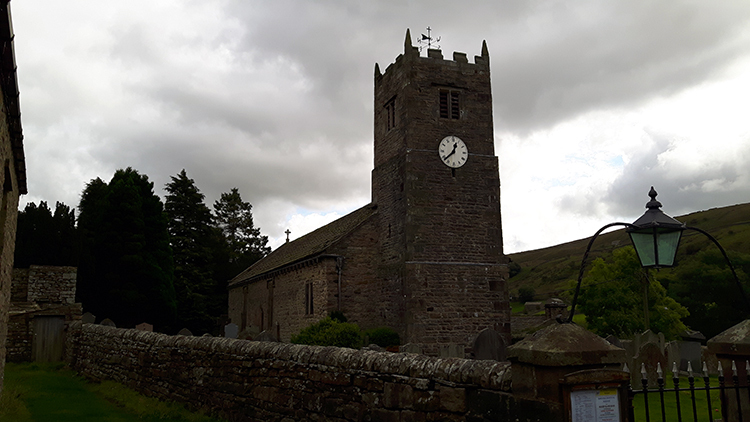 It was nine o'clock in the morning by the time we had set off from Reeth and approaching 9.30am by the time we had parked up in Muker, put on our boots were and had set off walking. Steve's four legged companion Keira was the keenest to get going but we were not far behind. We each looked forward to the walk. 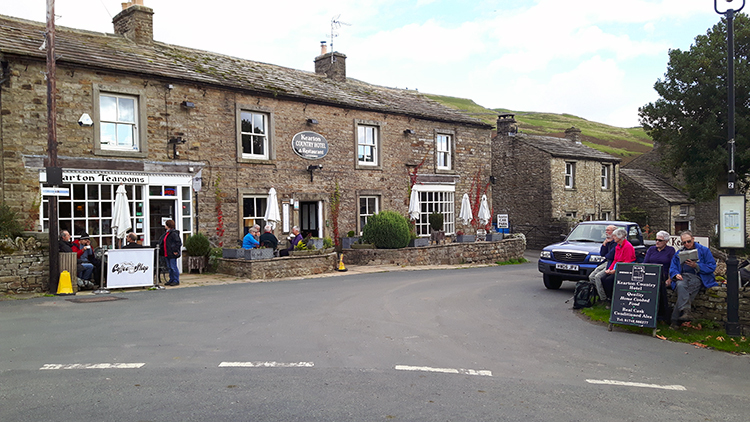 We had a little look around Muker before we left the village and headed up to the fells north of the Swaledale valley floor. Lil noted a small arts and craft shop which she would check out on our return. I admired the beautiful stone buildings of the village, each having its own merits. All had lovely managed gardens. There is pride in Muker. 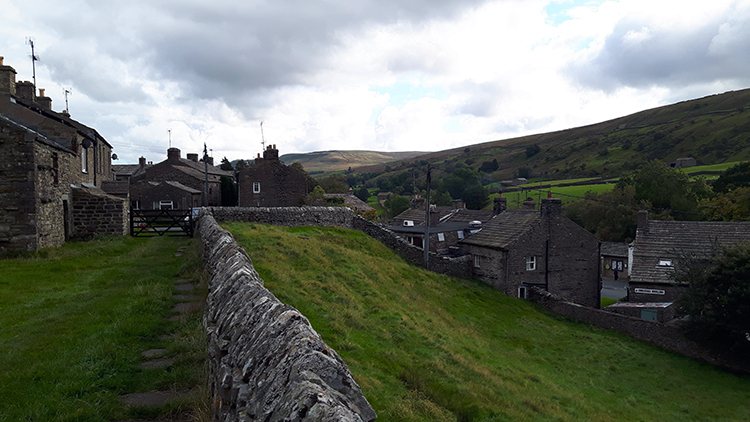 Though the village was a scattering of houses per-industrialisation and then built on during the lead mining boom of the 19th century it has not suffered the decline of so many villages with such a past. 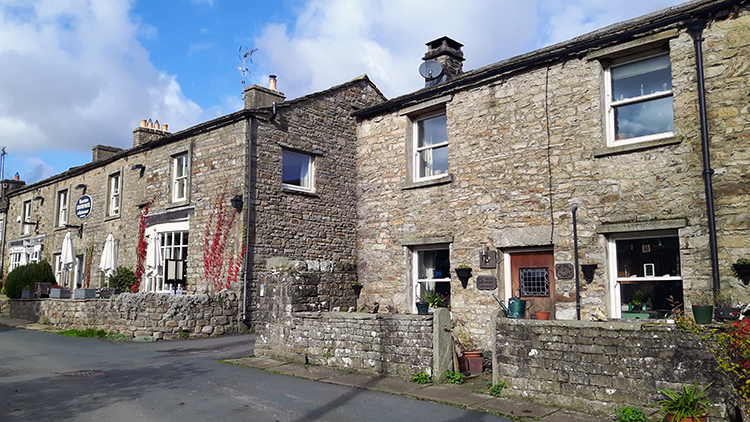 It thrives now thorough a diversification of farming, cottage industries such as Knitting for which the village is famed and through maintaining a determination to encourage and welcoming visitors. It wins but then again it has another benefit bestowed upon it; the wonderful piece of Swaledale it sits in. When we had left Muker to follow paths up onto the northern fell side the steady stream of traffic continued to arrive in the village. I looked back from our climb as the temporary population grew. 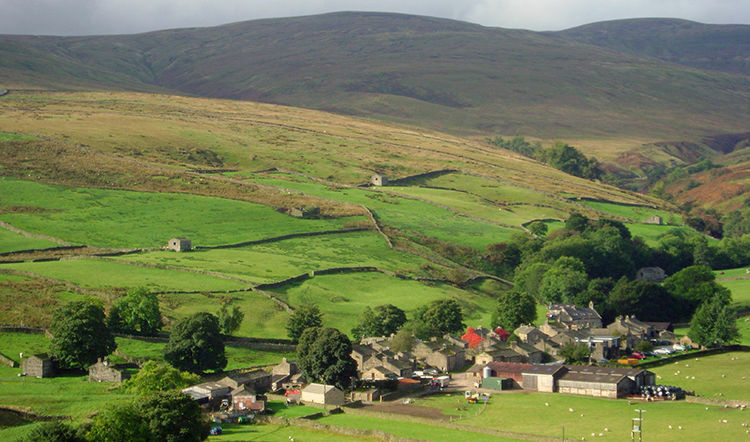 I could not focus on the village for too long though as we gained height the amazing glory of upper Swaledale unveiled in more and more picturesque delight. The random lines of field boundaries revealed themselves. There appeared to be some order to them but not much. The word parallel and unified in size and shape does not exist here. Each field has its own character though there is nearly always one unifying theme. Almost every field had a stone barn in one corner of it. 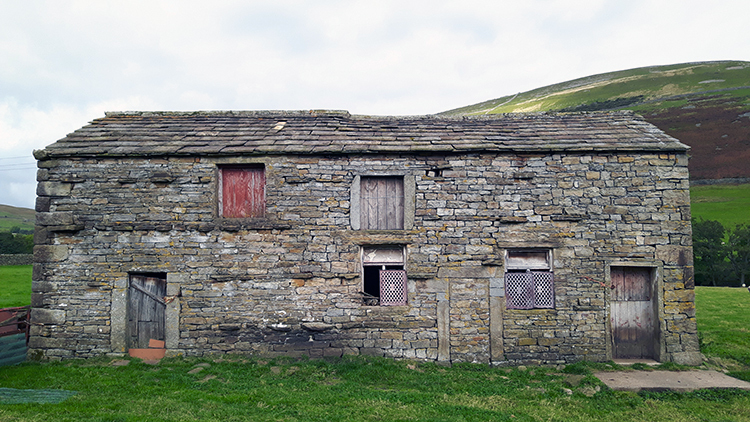 The barns of Swaledale are famous and by word they are beautiful to behold. Looking on the patchwork of fields and barns and on the young river flowing through the valley below I had not really taken any notice of the walk. It had just happened. 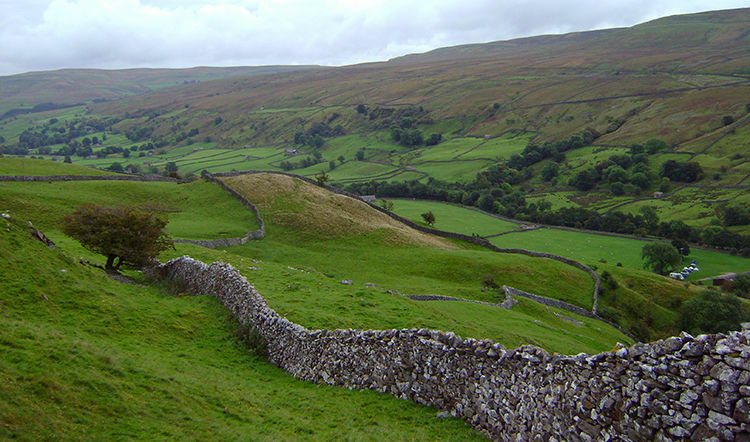 We had steadily climbed from Muker to Kisdon, a height gain of 130 metres. As we had walked leisurely and talked almost constantly I had not really noticed. Add in the marveling at the view and we were just there. Everyone of us was rapt by the view. After Kisdon though we did have to concentrate on where to put our feet. 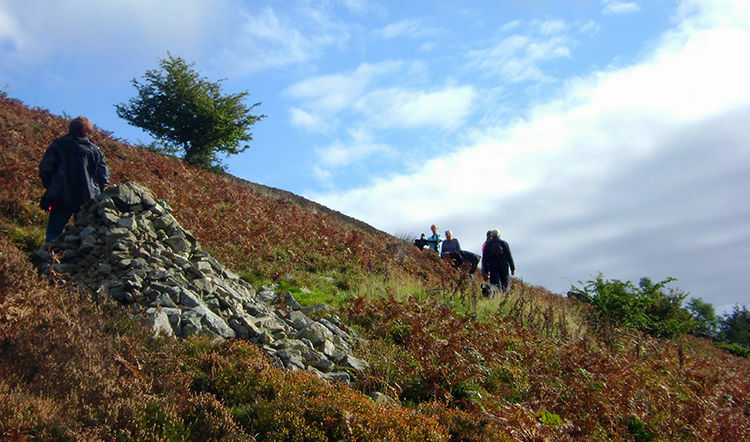 Easy walking on lanes and on paths across fields to our greatest height was followed by a careful descent on a sloping fell on what was now the Pennine Way. Note it was never difficult, it just needed a little care and attention to where to step. 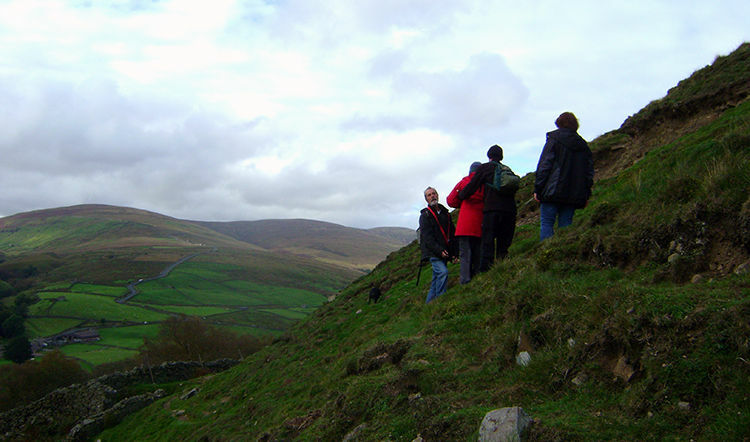 The benefit to me for taking a careful approach to the descent and periodically stopping to reassemble as a team was that I could look straight ahead to the view of far upper Swaledale, to the fledgling valley where the source of the Swale is at the confluence of the Birkdale Beck and the Great Sleddale Beck just east of Keld which laid around the right hand corner of Thwaite, the village I spied directly below and our chosen source of refreshments. Though it was a dry day the cloud had blanketed Swaledale but now the sun came out, lighting up the gorgeous view. 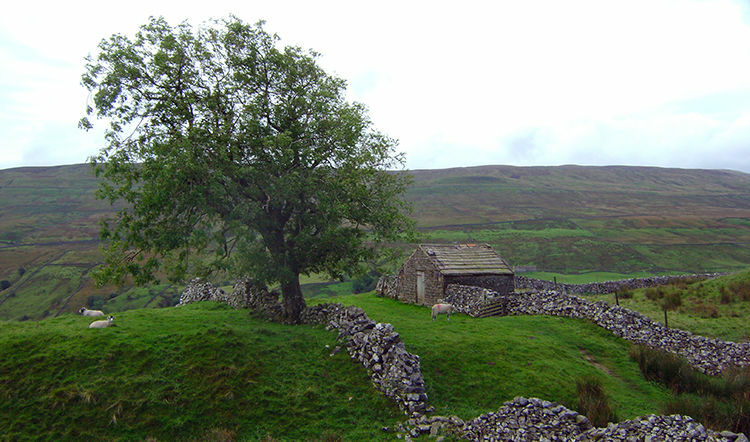 Behind Keld stood the bulk of Great Shunner Fell, a local icon of a hill. I like Great Shunner Fell. Steve does not. The Dales Celebration Way caused him such disdain for the hill. We came down from the fell side safely and followed the Pennine Way footpath into the village of Thwaite. A little smaller than Muker the village has a much quieter feel to it, most likely because the bulk of traffic which passes through Muker avails itself of the Buttertubs Pass which links Swaledale to Wensleydale. Thwaite is fortunate to be just beyond the junction and thus misses out on that dale hopping volume of traffic altogether. We walked through a series of small fields on the valley floor and into the village in practical silence. It was a lovely approach. As we walked towards the first houses of Thwaite Steve said to me "check if there is there a cafe open?". I hoped so. Though we had refreshments with us it was the preferred option for all. To our delight we found the Kearton Tearooms open. Not only that but to my surprise I found the coffee I chose to be very nice. On so many occasion when out walking and visiting local tearooms and cafes I have found the coffee to be wishy-washy but not here. This was well brewed and fresh tasteful coffee. The buns were lovely too. If the standard of Fayre is maintained I recommend Kearton Tearooms. The staff were friendly too. As we enjoyed our snacks a second group of walkers arrived and sat at an adjoining table to enjoy their break too. Then a third group arrived in the village. They sat on a wall opposite and took their home prepared options from their backpacks. Each to their own, all three groups appeared to thoroughly enjoy themselves. And who could not do so in such a lovely quiet and quaint setting. 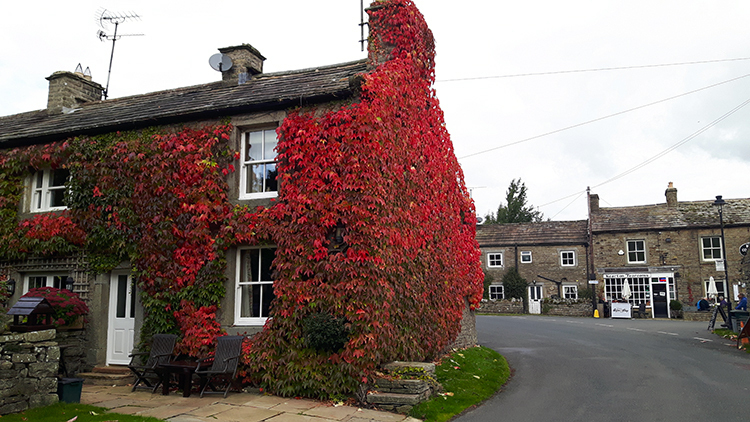 The flame red autumnal colour of a Russian Vine spread over a cottage in the village square provided a vivid splash of contrasting colour to the subtle Grey of the local stone built cottages. All was good in Thwaite. 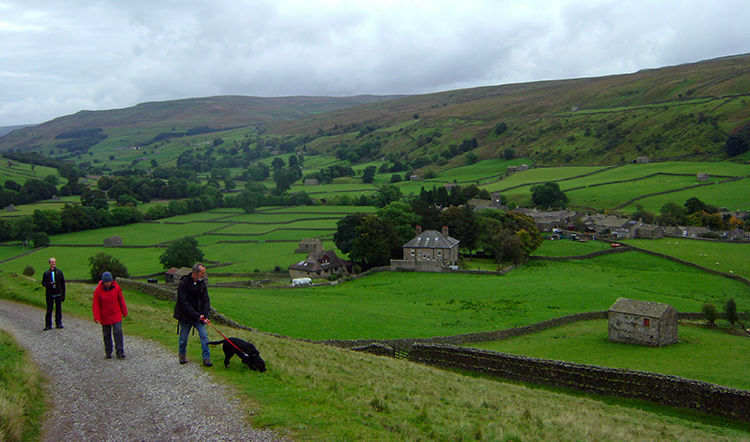 After the up and down of the walk from Muker to Thwaite our return journey was entirely flat. Not a metre of height was to be gained or lost bar small humps and hollows in the fields and on the lanes. 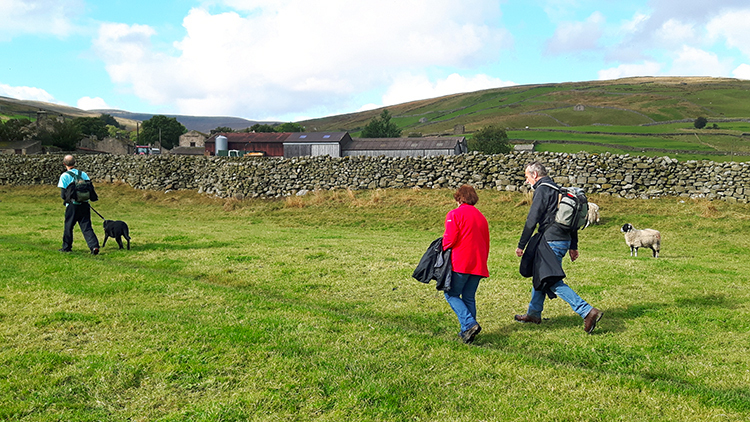 We began our return journey by walking through the same few fields we had crossed when entering Thwaite before parting the line to keep alongside Thwaite Beck on its course to meet the River Swale at Usha Gap Bridge. In one field we amused at three sheep taking it in turned to scratch their backs on a piece of farm machinery. If one of them appeared to take too long for its turn another would barge it aside to take its turn. It was funny. I also admired a couple of barns we walked closely past. They did seem used as blocked out windows to provide wind-break showed. 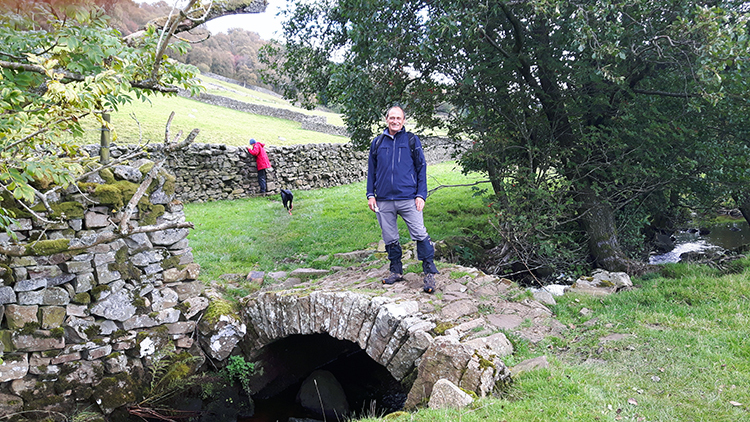 We continued on though the fields and also crossed a wee stone bridge over Thwaite Beck to reach Usha Gap Bridge from where we took ourselves carefully along a short stretch of road. Walking along the road was easily negotiable as it was a straight stretch of only 100 metres from Usha Gap Bridge to Usha Gap Farm. 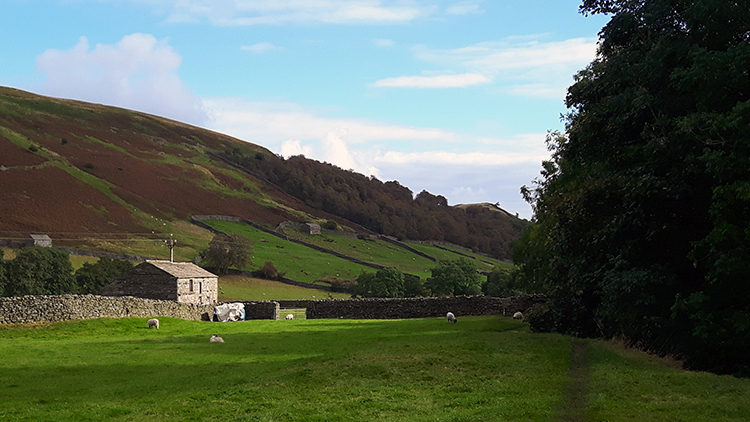 For me and Lil it was quiet and we never encountered one vehicle before leaving the road to follow the footpath across fields to Muker. For Dave, Steve and Jan it was a longer road walk and they did meet the odd car. Why? Because they walked slightly ahead of us and they missed spotting the signpost. hough they were only about 50 metres ahead of us when I beckoned them they chose to continue along the road. We had the better of it. From Usha Gap Farm Lil and I followed half a dozen more paddock fields back to Muker. Sheep were in each field and in every field the groups of Sheep scattered as we approached. There was no symmetry to their actions though, some went left and some went right and most of them in accord. Some though appeared not to be able to make their minds up on which side they wanted to be with though. First going one way and then scampering the other at the last possible moment. Sheep often surprise and amuse me at the same time with their indecision. 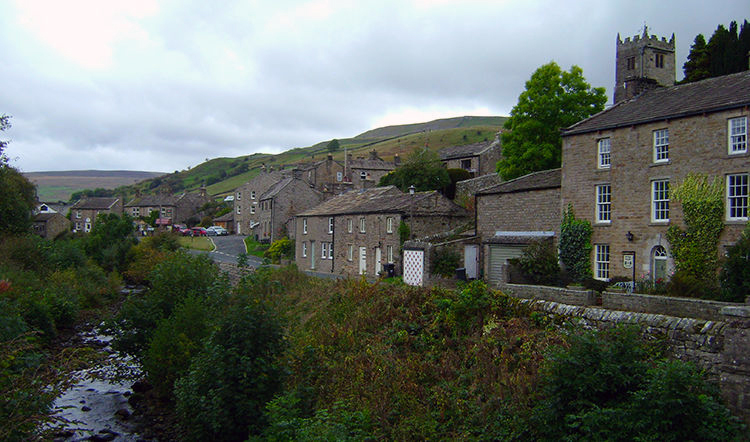 Lil and I walked back into Muker and as she had indicated earlier she headed into the village centre in a beeline for the art and crafts shop. Dave, being the artist among us, joined her in looking around the shop. Steve and Jan waited with Keira on a village bench. I headed towards the village church and looked up to the village clock. It was 11.40. We had been walking, not withstanding the break in Thwaite, for about two hours. Two delightful hours. Job done.